Today, more than a 1000 bloggers are flooding the blogosphere, the internet and timelines with stories about compassion and sentiments about kindness. 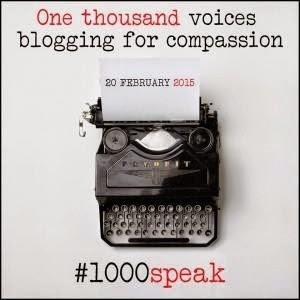 Today, 20th February 2015, is 1000 Voices for Compassion Day. I feel very strongly in issues like racism, sexism, ageism, ableism and discriminations that take away the basic right of a human being to live with dignity. But one issue I feel for even more, is the issue of hunger. No man, no woman, no child should go to bed hungry. Nobody should have to live by scrounging waste out of trashcans. Especially when in India, so many thousands of kilograms of food grains are going waste, and rotting in silos where nobody can reach them. So many litres of milk go to waste on worships and rituals, when a child on the street grows up malnourished. So much money goes into donations to houses of worship to no end, whereas a family starves to death in the villages. It's a promise I've made to myself, that in my capacity, I will never let anyone go hungry. As and when I do have children, this is a teaching that they too will get. Giveaway that packet of cereal you have extra. Someone needs it so much more than you do. To those who have the means, it is a negligible cost we bear. But for those who have next to nothing, it means a meal. Those with means will never be able to understand the pain of going hungry, the pain of seeing your family go hungry to sleep. And I will not allow it. as much as my capacity is, I promise to never let anyone go hungry again. Which is why, I have a plan that I wish to implement. Many kilograms of delicious food go to waste in restaurants, small, mid-size or large. I wish to implement a mechanism, that collects these extra food items, and deliver it to those who need it. I will do it, I can do it. Food should not be a privilege. In my own way, I wish to eliminate world hunger, a little spoonful at a time. And the day I bring this dream to reality, I will have achieved that one dream I've always had: never to see anyone go to sleep hungry. A child feeding the pups that live in her colony. A man buying an ice-cream for that child on the road. An office making a collection drive for a flood affected area. A husband making parathas for his wife, before he goes out for a meeting, because she'll be alone and may not want to cook only for herself. Spreading out a few grains of rice for the birds. Someone lending me a phone charger in my time of need. A school selling UNICEF cards to raise money. It's not about the strength. It's not the size of the problem, nor the size of your plan. It's not about who else is with you. It's about what you want to do. It's about how much you want to do. Wars. Injustice. Tears. Greed. Lust. Corruption of the soul. Wickedness. An astounding loss of humanity. Spoons of food from a nurse to a patient. A cat defending another in front of a dog. A star dressing up as the superhero on screen,visiting a children's hospital to make a sick child laugh. A humble auto driver in Mumbai who is the most selfless man I have ever read about. Compassion is not doing good for someone, and feeling good about oneself. Compassion should be like breathing. Do you give yourself credit for breathing? It should be the way you live. It should be how you live. I've never been truly hungry, but my husband survived a childhood of hunger and deprivation. Food waste extends beyond restaurants to grocery stores, farm fields and individual homes. It is a travesty that world wide we produce enough to amply feed everyone, but still fail to ensure the most basic of needs is met for our fellow human beings. Thank you for this reminder and the call to action. I feel fortunate to have connected to your site through #1000speak. Very noble thought to feed the hungry. Here in NZ each supermarket has a food bank where you can donate food and that is then distributed to those in need. I donate each week when I go to the supermarket. It's usually just a box of cereal, but each time I place it in the box, I say a prayer of thanks to God that I can afford to do this each week and a prayer that some child can enjoy his/her breakfast. I hope someday you will implement your dream.